The EzineArticles Formula is wrapping up its very first class and so far feedback has been great. Students tell us that the value they’re getting is tremendous! It’s been truly rewarding for Marc, Chris, Penny and me to interact with all of the students, answer questions and deliver the personal one-on-one training that’s part of this course. We’re happy to say that in the process we’ve gotten a lot of great compliments about the course and I wanted to share some of those with you today. You might be wondering what’s inside The EzineArticles Formula that would generate this sort of excitement from students. Optimize Your Keywords and Keyphrases – Do your research and come up with keywords that will rank high with the search engines. This will bring a larger audience to your articles. The trick is finding the right balance between using powerful keywords and destroying the readability of your article. Use Web Analytics to Find Powerful Keywords in Your Niche – Login to your website analytics package of choice and look for keywords that are being used to find your site. Then write your articles based on those keywords or keyphrases. Build Articles Around Chosen Keywords – You’ll find it easier to choose your keywords first and build your article around those keywords rather than trying the reverse. There are numerous tips just like those above inside The EzineArticles Formula, and you’ll soon have another chance to discover them all. The second class starts February 1st, and you can sign up starting Thursday, January 20th at 12:00PM, CST. For more details, go to EzineArticlesFormula.com. 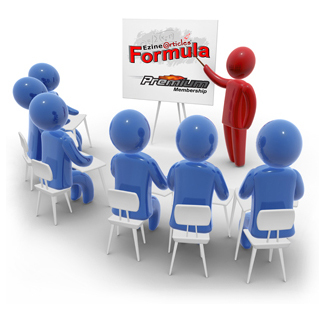 If you’re serious about adding article writing to your marketing toolbox and getting the most out of your efforts, go to EzineArticlesFormula.com and sign up for our newsletter to receive updates, tips and special announcements about The EzineArticles Formula. We’re getting ready for the 2nd session and looking forward to a class full of new ideas, fresh enthusiasm and lots of unanswered questions! We hope to see you there. That’s great. I’m gonna sign up now.